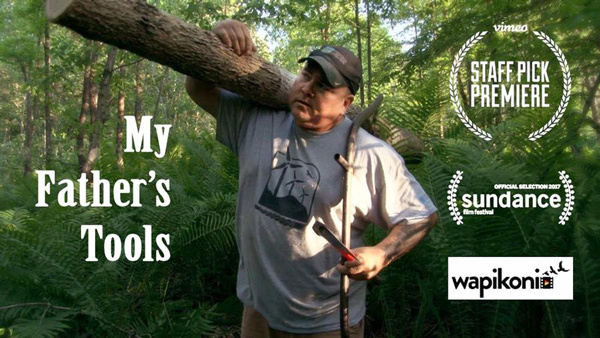 Nov. 29 is a proud day for Aboriginal people around the world as Vimeo selected Heather Condo’s "My Father’s Tools" as its first ever Staff Pick Premiere. This is the first time since Vimeo launched its Staff Picks Premieres channel last year that a Native short is featured to make its global debut to hundreds of millions of monthly viewers. Not only is the first Indigenous Staff Pick Premiere a Canadian film, but it was also directed by a first-time female filmmaker. Go to vimeo.com/channels/premieres/244882764 to watch the film that will go live on Nov. 29. "My Father’s Tools" (6 min 30) is an observational Canadian documentary directed by emerging filmmaker Heather Condo which had its international premiere at the 2017 Sundance Film Festival before touring the world (Telefilm Canada’s Not Short on Talent (Cannes and Berlinale), Seattle International Film Festival, ImagineNATIVE, DOXA, and over 50 others.) The story, which introduces Condo’s spouse Stephen Jerome, a traditional basket maker, is produced by Wapikoni mobile, a travelling audiovisual creation studio fully equipped with cutting-edge technology that visits Indigenous communities across Canada and Latin America to help spark the creativity of young Indigenous people. These videos become powerful tools for social change and are part of a journey towards reconciliation that also involves protecting the cultural heritage of Indigenous Nations. Weaved in cinema vérité style, the story of "My Father’s Tools" shows the craftsmanship of the man from the Mi’gmaq First Nation community of Gesgapegiag in the province of Quebec, Canada. Stephen continues to create traditional baskets just like his ancestors did, honouring his father with each stroke, finding peace in his studio as he connects spiritually with the man who taught him this ancestral art form. “My uncle John made baskets and I was always proud of that. I moved out of the community when I was a child and went to live in a predominantly white community in Massachusetts. I would bring his baskets to show and tell because I was very proud of my Native heritage. The kids used to make fun of me, but I didn’t let that bother me. Then I started dating Stephen, a basket maker from Gesgapegiag. I saw how much effort it took to make the baskets. It’s very physical. He is the last man in the community to make black ash rib baskets, and so I decided it was important to capture this craft before it becomes extinct,” Heather Condo said. Founded in 2004 and based in New York City, Vimeo is home to the world’s most imaginative video creators and the hundreds of millions of viewers who love them. Vimeo empowers over 50 million creators with the tools they need to host, share and sell videos in the highest quality possible. Also a leading online entertainment destination, Vimeo now reaches viewers in over 150 countries who can watch content anytime, on nearly every Internet-connected device. The Staff Picks Premiere channel was launched in 2016. Heather Condo was born in Maria, Quebec on October 14, 1971. She was adopted and grew up in Massachusetts. In 2005, Heather moved back to the First Nation community of Gesgapegiag where a lot of her family members reside. Her son Zachary Greenleaf who also made short films with Wapikoni mobile encouraged her to try this medium and let her creativity soar.